Product #1225 | SKU C21-6261-201 | 0.0 (no ratings yet) Thanks for your rating! 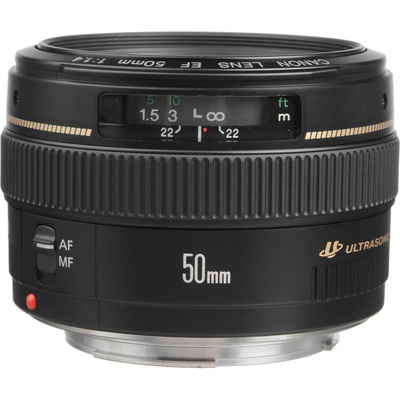 Offering a natural perspective along with a fast maximum aperture, the EF 50mm f/1.4 USM from Canon is a versatile normal-length prime characterised by its bright f/1.4 aperture to suit working in low-light conditions and for producing shallow depth of field imagery. This lens also features a Gaussian optics design, along with two high refractive index elements and one aspherical element, to control spherical aberrations and distortion for high sharpness and clarity. A Super Spectra coating has also been applied to suppress flare and ghosting for improved contrast and colour accuracy when working in difficult lighting conditions. Complementing the optical design is a micro USM, which enables quick and quiet autofocus performance along with full-time manual focus control. Bright f/1.4 maximum aperture suits working in low-light conditions and also affords great control over depth of field for isolating subjects and using selective focus techniques. Gaussian optics design, which includes one aspherical element and two high refractive index elements, notably reduces distortion and spherical aberrations for high sharpness and accurate rendering. A micro Ultrasonic Motor (USM) is employed to deliver fast, precise, and quiet autofocus performance as well as full-time manual focus override.